Riesling, of course, is the grape that most clearly of all reflects its terroir. But for the truly talented vinmakarna, particularly those working biodynamic, and some vineyards all wines exhibit the intrinsic features of the terroirs, regardless of variety. Grand Cru Altenberg de Bergbieten and surrounding vineyards always make a clear and unique imprint, even on the Sylvaner and Muscat. The calcareous marl and the relatively cool climate wines with the flesh, freshness, finesse and vitality. 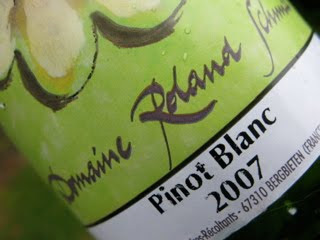 2007 Pinot Blanc is a fruity fragrance with a touch of fennel and citrus. The taste is medium full-bodied, firm but juicy with a typical and obvious taste of yellow, ripe grapefruit. A wine with class. Price: € 5.50.